Amazon has updated their original listing for Transformers: Bumblebee movie subline ‘Mission Vision‘ with additional details including the official product descriptions. SEE THE MISSION AS BUMBLEBEE: See the mission through the optics of Bumblebee. Look and click between three unique views: Bee Vision, Scout Vision, and Autobot Vision. Imagine choosing the best view for action-packed missions! CONVERTING ACTION: Convert 8-inch Mission Vision Bumblebee figure in 4 easy steps from robot to Chevrolet Camaro car mode — simple conversion fun for kids ages 6 and up. Mission Vision works in both modes! SEE THE MISSION AS SHATTER: See the mission through the optics of Shatter. Look and click between three unique views: Jet Vision, Tracker Vision, and Decepticon Vision. Imagine choosing the best view for action-packed missions! 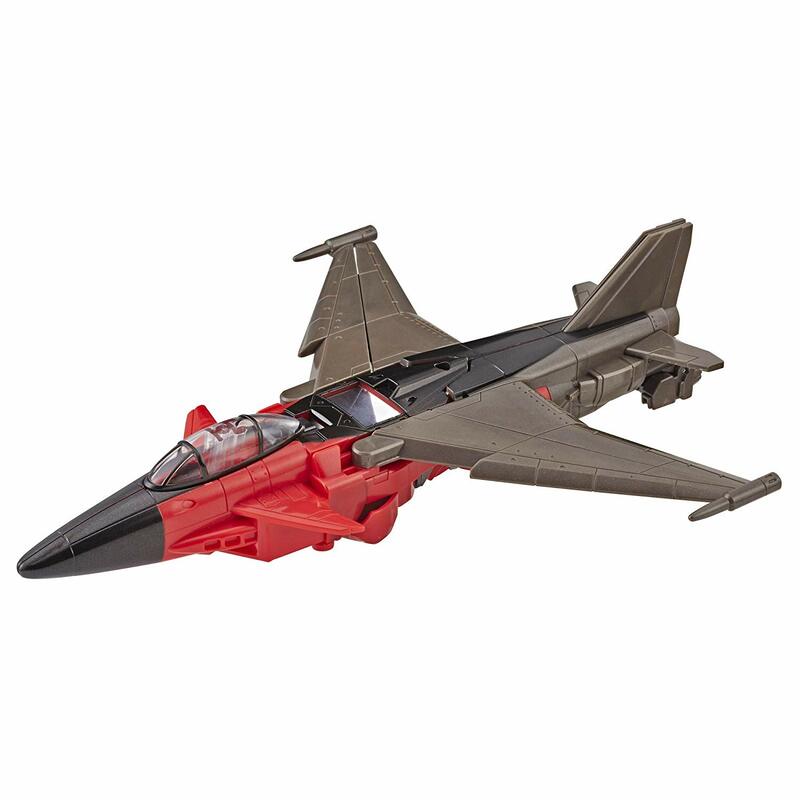 CONVERTING ACTION: Convert 8-inch Mission Vision Shatter figure in 6 easy steps from robot to jet mode — simple conversion fun for kids ages 6 and up. Mission Vision works in both modes! The figures are now available at US retail. And Fortnite just got a whole lot better! More accessible to newer players (as in you don't die in the first 5 seconds). For the amount one could spend on a plastic toy you could get so many AWESOME upgrades to your Fortnite or PUBG characters. Plus these freemium games are a store that is ALWAYS open every time they log in to play. That's your competition Hasbro (not just google play or iTunes app store) In App Purchases! Not to mention, Fortnite has toys. I just went to my local toy shop, and the Transformers section was all Bumblebee Energon Igniters and old Titans Return/TLK shelfwarmers. Nothing to get excited about. But then, near the entrance, there's this huge Fortnite display. If a kid goes into this toy shop, they're not even going to walk past the Fortnite toys long enough to even see Transformers. I mean, I'm not expecting Masterpiece-tier engineering, but if you want to compete with Fortnite and CoD (because like it or not, that's what kids would rather spend their time on), then you need QUALITY. You can make good-quality one-step changers for crying out loud (look at the Beast Wars and Machine Wars scouts, they're incredible little toys for the price point). If you want a kid to spend their parent's money on something, you've got to do better than a freakin' Viewmaster. Remember when the gimmicky lines were stuff like Activators? or fast action battlers? man I never appreciated those days enough. these are just pure plastic garbage. This is such an "INSULTING" toy line. Kids today know how to work iPads and computers. Mission vision transformers? some stupid eye piece gimmick? Kids are waaaaaaaaaaaay smarter than this. Just think of how much money is spent on these stupid gimmicky figures, just wasted to be peg warmers. How much money is wasted on the time, effort, the plastic. How much of that could have gone to a normal transformers line where the gimmick was simply a fully articulated figure of a character in the movie transforms into a exact copy of the vehicle from the movie. That's it, that is all you need to make. Hell, maybe save some money, enough to lower the prices on your figures. Every time I see an new gimmick based entry into the line, I see a reason why what was once a $12-$15 deluxe is now $20. I don’t understand the basis of the line – is there some gimmick related to each “vision” or something? In the movie there are some scenes from the robot's POV – my guess is they are meant to recreate the HUDs they have in those scenes. I'm mildly surprised it took this long to bring in the gimmick, since it's been done to a greater or lesser extent in Transformers media as far back as Beast Wars. Hopefully, Bumblebee bombed bad enough that Paramount doesn't rush out another one for a while. Its not the movies, its this mindset Hasbro seems to have that kids want these cheap dimestore type toys. If you were a kid, what would you want more? One of these or something like a RoTF deluxe? Unfortunately for that sentiment, the movie's doing pretty well for itself. I still am finding AoE One-Steps at some stores. Good idea for a gimmick toy. If they're of the normal Vietnam slave factory QC and Odds Lots level plastics as the rest of the Bumblebee and Cyberverse toys, they're disposable crap best ignored. They look okay, although the deco for Shatter is underwhelming, surely they could have spared some paint for her face. I do like the look of these. good idea for a gimmick. based on what I\'ve seen in the ad im assuming the idea is to create the message deliverance bit. \"I pray this message finds you\". as for bee, just like the energon igniters, the dark grey looks really nice up against the yellow. I\'m digging shatters alt-mode. but her mask is in desperate need of some sort of paint detail, something, anything… I must say Hasbro has gotten pretty good at giving a figure just enough detail to make it appealing. the bare minimum. Man, looking at all the camaro mode Bee toys compared to the actual camaro bee model we see in the trailers, I think it\'s safe to say they originally planned on straight up using the 07 film design for that part of the movie, but decided to change it to more closely mimick the new design. Yes he still has the camaro hood chest, but he retains his simplicity and many of the new design elements (like his rounded head, simplified face, smooth chunky shoulders, and his lack of outward door wings). Again, it could just be to keep the art style within the film more consistent, but I think it leads creedence to the movie being a reboot. It seems like they were originally going to directy connect the films by having bee in the exact same design as 07, so it seems like a pointed desicion to change that. The stores and wholesalers buy them in huge numbers, that's when Hasbro recoup their money, and stores still stock them despite seemingly slow sales.And to be fair, where I am, Generations/Premier Edition/Masterpiece (when we still had TRU) clog shelves just as much as gimmick figures due to the higher prices. The thing is, all the time stores keep ordering everything solicited to them Hasbro will continue to make them. I think the problem is more that sroes over-order initial waves which then block the way for later waves. Stores just need to order in smaller numbers and them maybe there wouldn't be quite so much shelf-warming. That I believe. The stores screw it up. To Hasbro a toy sold is a toy sold. Even if they are all bought by toy stores and scalpers. We dont need dumber toys. We need smarter kids. Im not saying kids dont still play with toys by any means. But I do believe Hasbro is is losing in denial of the reality that Transformers is becoming more of a teen and man child hobby while actual kids move into tech toys like ipads, video games, and RC cars. These things clog the shelves every movie and Hasbro doesnt take notes. Nobody ends up buying them in the huge numbers Hasbro pumps them out every time. Maybe these things do better in 3rd world countries where everyone is broke but they chose to have 5 kids. Hasbro should market them there instead of making a giant display of junk figures at walmart and target. Thats my opinion anyways.